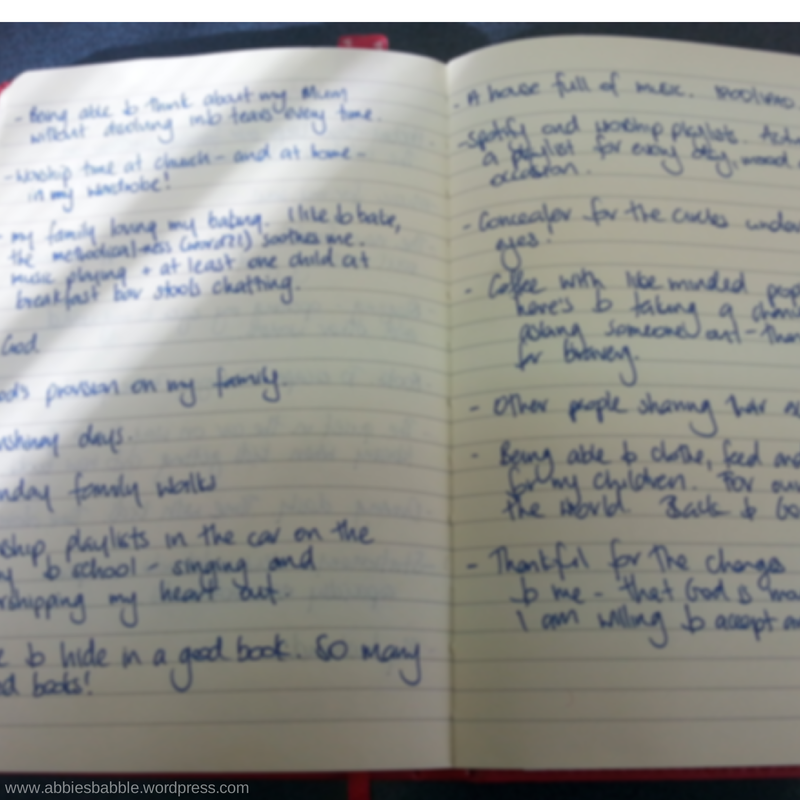 I’m really loving the process of intentionally thinking about and writing down the things I am thankful for. It is easy to travel day-to-day saying the same grace at each meal, and the same prayers with the kids at bedtime, but not really thinking about how many blessings have actually been heaped on our lives. I’m a lot more inspired and thoughtful and GRATEFUL now. My prayers are changing. I have pages of thanksgiving in the part of my journal sectioned for this purpose. I will stop in a cafe and scribble something down. Sit in my coffee break and write notes. All the while thinking on those things, and realizing more and more how blessed I am. My perspective is changing. Some of the notes seem silly – like being thankful for concealer to hide the circles under my eyes after a sleepless night. But isn’t it better to be grateful for the concealer than labour over the fact that I’m an exhausted insomniac? Yes I do think so! A lot of my notes are about music – I’m grateful for an amazing worship at church, a great Spotify playlist to worship at home, singing my heart out in the car. There’s a post coming about what’s on my playlist at the moment so I’ll leave this one there. Intentional gratitude isn’t anything new, and I’ve always tried to be a bit of an optimist, but applying gratitude to my life this way is new. And I like it. A lot.